As a technically challenged blogger I’m always interested in tricks and tools that enhance my bloggery and make it look as if I know what I’m doing. So when Brian Clark launched Scribe SEO , a tool geared towards assisting SEO idiots (like me) in optimizing their blog posts, I decided to give it whirl. Between you and me, I sometimes wonder how my blog achieved this level of success because I’m not an SEO maven and wouldn’t know a high ranking keyword if it reached up and tweaked my nose. My only experience with keywords and SEO, besides what I research for this blog network, is writing dozens of keyword heavy articles for other people, a job that bored me to tears.To be even more honest, I have no clue about meta data and I can’t write headlines to save my life. Apparently, these are important. Who knew? So I decided to invest in the Scribe plugin. At $27 per month, it’s reasonably priced and, if it helps me learn about this SEO stuff and helps people find our blog posts, that’s gravy in the boat. That it’s a plugin was a semi- issue for me. Technically challenged bloggers have no clue how to plug stuff in. Fortunately we’re very good at opening our wallets to pay our resident techie and she had it up and running in no time. Those little red warning lights are telling me I need meta information and tags for my post. If there was no content, the “content read” button would have a big fat red minus sign as well. I like the reminders. I’m a pretty good tagger, but always forget about the meta stuff. My post and run method of blogging comes back to haunt me. 94% Hot diggity, I got an A! As you can see, this post is good to go, but can use a few tweaks. For example, DOH!!! I forgot to add hyperlinks. Thank you, Scribe for having my back. One or two more links and I’m good to go. Scribe also says I need some help with my primary keywords. Scribe always has issues with my primary keywords. Scribe always wants them way at the top of the page and they don’t always work out that way. I hate to anger Scribe but I don’t like to get all obvious with the keywords either. As you can see, Scribe is telling me how I’m doing with my keywords. Notice” Scribe,” a primary keyword is right where it should be. On the other side of the coin, “Brian Clark” isn’t emphasized much at all. However, I hear tell he’s a little shy and probably likes it that way so we’re good. Scribe also shows me how my blog will look in the SERPs and offers suggestions for changing or adding keywords. Do I like Scribe SEO and recommend it to other technically challenged SEO idiots? Abso-friggin-lutely. I’m totally digging this puppy if only because it prompts me to slow down and pay attention to what I’m doing. I’m also understanding how all this SEO/keyword stuff works a little better. Oh, and I can use it all by myself without having to contact technical support. A major plus. Mostly though it reminds me of everything I’m mising in my post. Brian and his team have a winner here. 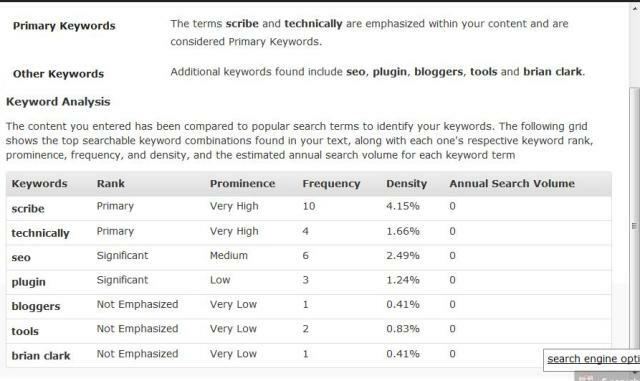 Now, keep in mind Scribe only works if you have the “All in One SEO” plugin, which I do and have had for a while, or if you use the Thesis, Hybrid or Headway Themes for WordPress. The All in One SEO plugin is free, however, so you have no excuse. Full Disclosure: Copyblogger didn’t send me the love. No one asked me to do this review. No one paid me anything, no one gave me anything for free, I’m not selling anything and I have no affiliate links in this post. But I’m not bitter. I just felt like passing on a cool new tool. Do with this what you will. EDITED TO ADD: Back the truck up. It appears I have something to sell after all. Brian Clark dropped by to say hello and kindly gave me access to the Scribe SEO affiliate programs. So yeah, if you buy, I profit. Looking at your article it appears you scored 94% without having to make many changes, so your writing for this article for pretty good SEO wise – so what benefit did the plugin give you? also you say ‘if you use the Thesis, Hybrid or Headway Themes for WordPress. The plugin is free…’ are you sure that is accurate? The benefit is that the plugin is making more aware of the keywords I use and their placement, and also reminding me of items I usually forget such. Also, I don’t always score in the 90’s. The first time I used Scribe my score was a 57. Regarding the plugin, I was referring to All in One SEO plugin – going to tweak the text so that makes more sense. Now I’m liking the sound of this. These are the little things I try to look for, often forget, and really need to pay more attention to. Thanks for bringing it to my attention, Deb! .-= Jennifer Escalona´s last blog ..Bookkeeping..Can I change the description? =-. Good review; I’m testing too and wishing I had a forum to ask some questions… maybe they will add that… in fact I’ve requested it. .-= Anne Wayman´s last blog ..Friday Fun For Freelance Writers =-. As it turns out, they have a Q&A system, but it only shows up after you’ve bought a subscription. I got quite a bit of enlightenment that way, but like you, I wish I could have had some of my questions answered beforehand. Otherwise, I tested Scribe by optimizing a few old posts and loved it! The recommendations are mostly common sense SEO tricks, but those are easy to miss or forget, especially for someone like me who isn’t naturally very technical. I was sold, and ended up turning a client to Scribe, too. I agree that a forum would be helpful. The support center is pretty good now, but there aren’t that many posts. Over time it might get unwieldy. Then again, the Thesis forum can be a bit hard to navigate at times as well. .-= Patrick K. O’Brien´s last blog ..Bare Essence Squeeze Pages Review =-. Glad you’re digging Scribe and thanks for the kind words. .-= Brian Clark´s last blog ..14 Lessons Learned from One of the World’s Highest-Paid Copywriters (Lessons 6-10) =-. You are several steps ahead of me. I have All in One SEO plugin and have for a while but didn’t read up about it so I didn’t understand that I had to complete something for every postd. I purchased Scribe yesterday and the green light went on for content but couldn’t figure out what they were referring to about meta tags. I schedule my blog anyway. I am a member of Third Tribe Community so today I posted on the forum with HELP in the subject line and Robert Dempsey came to the rescue. Now I know how to use Scribe. Incidentally, my post scored only 64%. From now on I know what I have to do. I am so happy that I am in great company when it comes to being technically challenged. Thanks for the post. .-= Avil Beckford´s last blog ..The Invisible Mentor Career Corner =-. I know exactly what you mean. Two years ago the Scribe SEO plugin would have been out of the question for me. I wish I could tell you there’s a cheaper version but this is it. I also use SEOBook’s free SEO toolbar for FireFox. The toolbar has a few goodies for checking how your stuff is doing SEO-Wise and also how your competitors are doing. There are keyword analyzers, website comparison tools and more. That might be a good place to start. Do you know how Brian feels about people sharing subscriptions? I see the service lets you install it on multiple blogs…it would be affordable for me if I teamed up with a few other bloggers from my writer’s group and got a joint account. That’s how another member of our group manages her MediaBistro membership – she and a few other writers split the cost. .-= Sierra Black´s last blog ..Link Round-up =-. Sierra, I don’t know how Brian feels about most things but I can tell you the Scribe SEO subscriber can use the service for as many blogs as s/he likes. This looks amazing, but $27 a month is a pretty steep price for those of us who are just starting out or have smaller blogs. Is there a simple free or less pricey tool that can help me learn some of these same tricks? .-= Sierra Black´s last blog ..Nerve endings =-. There really aren’t any tricks, per se. What Scribe applies are pretty well established rules of thumb for “on-page search engine optimization”. Just do a Google search for that phrase and you should be able to learn the basics rather quickly. What you won’t get is the convenience and time-saving that you get from having Scribe installed within your WordPress admin interface. I have to give you ten points for the Full Disclosure element of your posts. I am completely happy to take a recommendation from a respected authority (that’s you 🙂 that has a vested interest in a product – on two conditions: One, when I know there is a vested interest and Two, when the recommendation is genuine. You firmly check both those boxes with all these kinds of posts, and I’m sure I’m not the only one who appreciates your candidness. Rock on Deb, you deserve your fans. .-= Imogen´s last blog ..A birthday post…. =-. Thanks for your kind words. When I recommend stuff, I only recommend stuff I believe in. I’ve turned down many sponsored post offers because they had nothing to do with the FWJ community or because they were for products or services that were flat out lousy. One time I reviewed something and it was so awful that I told the manufacturer I was going to post a bad review, he opted not to have it run at all. I hope the FWJ community knows I won’t try to push crap. It’s very obvious I monetize my blog, but not at the expense of you all. .-= Anne Wayman´s last blog ..Google / Author’s Guild Decision Delayed =-. Anne, I’m interested in your thoughts as well. I actually just downloaded this the other day. I haven’t had much of a chance to play with it but I’m glad to see it’s working for you. I can’t wait to start a new post tomorrow so I can play. What I have used of it so far I’m happy with. They have something extremely useful here. .-= Christopher´s last blog ..8 How Phrases That Can Hold You Back =-. You know what I like about this post, Deb? One – you’re totally OK with letting the world know that SEO isn’t exactly your cup of tea. But two – that you recognize that ignoring it won’t make the problem go away! SEO is and will likely always be an important piece of the copywriter puzzle. And it’s OK that you don’t have all the knowledge/skill to tackle it. But recognizing that there are (great!) tools available that will do a little virtual hand holding and that taking steps to address that little gap in knowledge doesn’t have to be that intimidating. Sure, it may cost a bit if you want it done well. But the important thing is that you’re crossing your T’s and dotting your I’s… showing commitment to your craft. A+ in my book! Thanks, Patrick. That’s why collaborations rock. Align yourself with a writer and the sky is the limit! Thank you for information on scribeseo tool. I am about to start testing it for my online business. I am blogger and PR 2.0 writer. I think it is really cool pluggin and thanks to Brian Clark with SEOScribe for getting it out there. I will be writing review too soon. Will keep you posted! Thank you for information on scribeseo tool. I am about to start testing it for my online business. I am blogger and PR 2.0 writer. I think it is really cool pluggin and thanks to Brian Clark with SCRRIBESEO for getting it out there. You may want to update the post, I think Scribe SEO is now going for $17 starting package. The concept of Scribe SEO is great but I think it falls a bit short. SEO consists of two parts. 1. Content optimization which Scribe SEO does well. 2. Content distribution, which scribe does not do at all. With social media in the works its more important than ever to distribute your content as quickly and easily as possible. Content distribution is becoming more and more important. Disclaimer: I’m affiliated with Arkayne and happy to discuss the comparison chart. Scribe SEO Rocks, and so does Shawn Jackson and CopyBlogger.. VERY awesome stuff..